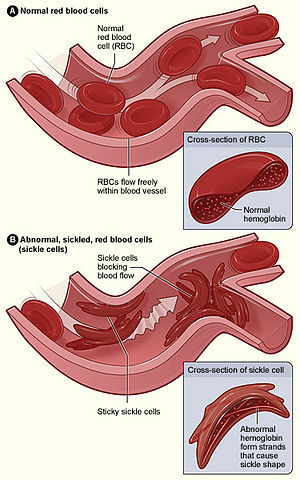 ​What is sickle cell disease? Sickle cell disease is an inherited disease in which a person does not have enough healthy red blood cells to carry oxygen throughout the body. Sickle cell disease affects the oxygen-carrying protein inside the red blood cells called hemoglobin. Sickle cell disease occurs when an individual inherits two sickle hemoglobin genes from both parents or a combination of one sickle hemoglobin gene and another abnormal hemoglobin gene from the parents. As a result, the blood supply to that part of the body is restricted. Organs that do not receive normal blood flow will become damaged over time. Restricted blood flow is what causes the complications of sickle cell disease, which can range from mild fatigue to more severe symptoms such as stroke, infections, and pain in the bones and chest requiring treatment in the hospital. The complications vary from person to person, with some having to see their doctor often and others less so. There is no cure for most people with sickle cell disease, as they are born with the abnormal hemoglobin. However, there are treatments and medicines that control or prevent the health problems caused by the disease. A sickle cell crisis occurs when sickled red blood cells form clumps in the bloodstream. (Other cells also may play a role in this clumping process). These clumps of cells block blood flow through the small blood vessels in the limbs and organs. This can cause pain and organ damage. Early diagnosis of sickle cell disease is very important so that children who have the condition can get proper treatment. Almost all states in the United States now test newborns for sickle cell disease with a blood test. Anyone can request a sickle cell test. Although a blood test can diagnose sickle cell disease, doctors are not able to predict how seriously the disease will affect individual patients. There is no simple test to identify which patients will have almost normal life spans, very few painful crises, and little damage to their body due to their sickled cells, and which patients will have frequent, painful crises and drastically reduced life spans. For this reason, deciding on a course of treatment can be very difficult. Sickle cell disease has no widely available cure. However, certain medicines such as hydroxyurea, antibiotics and blood transfusions (for some) can relieve symptoms of this disease. In addition, when complications happen these will require treatment and sometimes require a stay in the hospital. For some with sickle cell disease, these treatments are sufficient to control their disease, and it allows them to live like someone without sickle cell disease, even though they have the disease. For others this is not the case. It is for this group of persons who do not respond to medical treatment, a transplant of bone marrow or cord blood offers the possibility of curing the disease. Bone marrow or cord blood transplant can offer the chance for a possible cure for patients with severe sickle cell disease, but it has serious risks and may not be an option for all patients. A bone marrow or cord blood transplant replaces the abnormal cells in the bone marrow with healthy blood-forming cells from a family member or an unrelated donor or cord blood unit. A transplant may be a good option for patients who have a suitably matched donor or cord blood unit and are healthy enough to tolerate a transplant. The donor for a transplant must closely match the patient's tissue type. The best donor is usually a sibling. However, since sickle cell disease is inherited, many people with sickle cell disease do not have a healthy matched donor in their family. Persons with sickle cell disease should consult with their physician regarding the possibility of a transplant. If you or your child has sickle cell disease, it is important to see a doctor who is an expert in the disease. If your doctor has not treated other patients with sickle cell disease, ask him or her to refer you to an expert for consultation. A doctor who is an expert in sickle cell disease (hematologist) can talk with you about your treatment options and explain the possible risks and benefits. Whatever treatment you and your doctor decide on, you may choose to be part of a clinical trial. Clinical trials help doctors gain knowledge that can improve treatments for patients in the future. Even standard treatments continue to be studied in clinical trials. Although there is no universal cure for sickle cell disease, with effective treatment and appropriate medical care, survival rates and the quality of life for persons with sickle cell disease has been greatly improved.